THE ISSUE: the Pennsylvania Legislature redraws the boundaries of our Congressional, state House and state Senate districts every ten years, after each national census. But the original goal of redistricting -- to ensure voting districts remain equal in population -- has been undermined by political manipulation of electoral boundaries by both major parties. 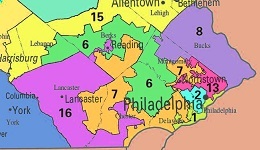 Currently, politicians can choose their voters by the way district boundaries are drawn, so many Pennsylvania candidates now run unopposed. But Pennsylvania can change the redistricting process to ensure that citizens have fair representation in government. Carol Kuniholm (Co-founder and Chair of Fair Districts PA) will present an overview of the issue and proposed legislation that is already working well in other states. The discussion will continue with other invited guests from the Pennsylvania Legislature, and there will be time for audience questions. For additional details and pre-registration click here. Sponsored by the League of Women Voters of Lehigh County and the Justice and Advocacy Committee of the Lehigh Conference of Churches.